Salad greens topped with sweet strawberries, crisp bacon, grilled chicken, candied nuts, and creamy swiss. 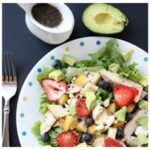 Top it all off with a creamy lemon poppyseed dressing and dinner is served! To make the dressing, combine all ingredients, except poppyseeds, in a blender or a mixing bowl and whisk or blend until well combined. Mix in poppyseeds. For the salad, assemble each salad on its plate individually starting with the greens. Layer on the strawberries, candied nuts, bacon, chicken, and cheese. Top with dressing and serve immediately.